I left active duty and three days later began training with Continental Airlines. It was a radical transition. I was assigned to the Boeing 707/720 as a flight engineer, the #3 pilot in the cockpit. How far I have fallen, I thought. It was an easy job, but very boring. I was grateful that I could still fly F-8s in the Reserves. After a year, the airline furloughed over 100 pilots, including me. I had already begun flying with the Ready Reserves at NAS Dallas while I was working on an MBA, so I had plenty to keep me busy. Among those furloughed by Continental was a close-knit group of former Miramar aviators from both the F-4 and F-8 communities. We compared job strategies, and decided to apply to go back on active duty. The air war had begun to heat up again, and the Navy belatedly realized it had lost too many junior officers to the airlines. One of my F-4 contemporaries, also an LSO, went back on active duty and became an air wing LSO on a big-deck carrier. Another was assigned to a plush tour at NAS Glynco, flying the T-39 for training RIOs. An Academy Classmate was assigned to the Pensacola Dilbert Dunker crew and the swimming pool as a lifeguard. Since our civilian jobs were protected by federal law, I decided to try my luck and apply for active duty. I submitted an application for the temporary recall program to BUPERS. In a few weeks, I received a letter rejecting my application. I felt my qualifications were at least as good as the pilots that had been accepted, so I traveled back to BUPERS in the Washington area to review my file. What I found was amazing and a real insight into how the Navy hierarchy holds a grudge, not unlike a vicious ex-spouse. When I arrived at BUPERS, I filled out a form requesting my file from the archives. After 45 minutes, an attractive female LT walked in to the visitors' room and called my name. She looked very serious. I introduced myself, and mentioned that I was trying to figure out why I had not been accepted back on active duty, when my contemporaries were. She said, "Well, your personnel jacket has a red flag on it." "What is that? Some kind of special award?" "It means that the Navy considers you to be……well, a problem. The letter of resignation that you wrote was passed around to all of the Navy's senior admirals to demonstrate why the junior pilots were leaving the Navy. They didn't like what you said, which resulted in your being 'flagged.'" "I think 'flogged' is more like it," I said. She shrugged. It struck me as a little odd that you are required to state the reason for your resignation in the letter, but they really did not want to hear it, and got mad when they did. When in doubt, kill the messenger. I sat down and read my Fitness Reports, hoping to find some helpful material. Considering some of my Red Lightnings escapades, they were all excellent---until I got to the RAG pages. As expected, the RAG CO had really hammered me. He characterized me as "disloyal to the Naval Service, because he is a Naval Academy graduate and he has resigned from active duty." That was an odd rationale, particularly since he was not an Academy graduate. A cynical observer might ask, if he resigned, would he also be "disloyal" to the Naval Service? Or is that "duty of loyalty" only attached to Academy graduates? The stupid mistake I had made was to forget that I was no longer irreplaceable as before. I was only another junior officer in the RAG. In fact, I gave away my leverage and ability to stand up against arbitrary and unfair treatment the minute I announced that I was (1) not going to be an LSO, and (2) not remaining on active duty. From those moments on, I was "a dead man walking." I called my BUPERS detailer and tried to get around the "flagged jacket" problem. 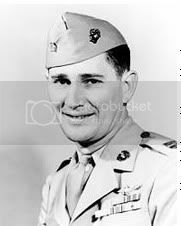 CAPT Harry Post, who I knew from Miramar, was no help. He was always a very cautious politician, and never liked to make waves. He said, "My hands are tied. You really upset the top brass." Obviously, this was one of my special talents. I concluded that it was time to move on. I turned my attention to flying with the Reserves in Dallas. VF-202 was a diverse group of aviators, each with thousands of hours, acquired in many different aircraft. Nearly all were airline pilots in their "day" job, and flew the F-8H at NAS Dallas as a sort of "flying club" activity. We were all there for one reason---we loved flying jets, and the F-8 in particular. Ironically, the "H" model, flown by the Reserves, was now the best performing F-8 flying, and the Fleet squadrons were forced to fly the treacherous "J". Life is frequently unfair. I reported in to VF-202, and walked into the ready room. It was another déjà vu moment. Although I did not know any of the pilots, they knew me. "Hey, guys, Hot Dog is here!" exclaimed the duty officer. As I was introduced to everyone, I was certain that this was going to be a good time. I have never been around a group of people that I liked more than the pilots of VF-202. There were a couple of experienced F-8 drivers, including P.J. Smith and Ken Fox, but most had flown a different aircraft in the Fleet. They had transitioned to the F-8 to fly in the Dallas Reserves. One LCDR was actually an inter-service transfer from the Air Force, where he had flown F-86s! Nevertheless, they all were highly experienced jet pilots. During the Pueblo incident, this squadron had been called to active duty and was actually scheduled to be deployed on a carrier. They were very colorful when they first arrived at Miramar. They taxied in to their line after landing and simultaneously extended their fueling probes, from which a Texas flag was attached. They got out of their aircraft wearing ten-gallon cowboy hats and cowboy boots. Every week, they flew cases of Lone Star beer in from Dallas for Happy Hour, and would not drink any other brand. When they tried to qualify that squadron on the carrier, several of the pilots had problems, especially at night. As one nervous pilot was sitting at full power on the catapult one night, the Air Boss announced on the radio that the squadron had just been deactivated and would be returning to Dallas. Without waiting for the catapult to be secured, he shut down the engine and climbed down to the flight deck. After that experience, the Navy decided to enhance the Reserve capabilities with better aircraft, more flying time and a requirement to maintain annual carrier qualifications. Now I understood why I was able to get into this squadron so easily. They needed an LSO. Here we go again. We were soon deployed to MCAS Yuma for weapons training. After we returned, I decided that I could contribute to the squadron's success if I picked up the LSO "paddles" again. Now I had come full circle---or had I just grown up a little? For the next few months, we incorporated Field Carrier Landing Practice (FCLP) into the daily flight schedules. The squadron's performance was improving each month. Still, I had concerns about actual carrier landings for some of the pilots, who had few carrier landings in any aircraft. I had the most F-8 carrier landings in the squadron, so I felt it was up to me to get everyone ready. FCLP "bounces" are normally done at night, when there is less runway traffic. One spring night, it was my turn to get some practice from the cockpit. I took off with a light fuel load, and returned to the base traffic pattern, entering the break at about 300 kts. Just as I passed over the runway, the aircraft shook with a loud bang, followed by an engine FIRE light. Instinctively, I reached for the face curtain to eject. Then I remembered that if I ejected, the aircraft would probably drop into the LTV factory complex to the west of the field. Since the engine was still running, I kept one hand on the face curtain and flew the bird with the other. So far, so good. I can make the runway, I thought. I notified the tower that I had an emergency and a fire light, and requested clearance for a full-stop and for fire equipment to meet me. "Roger, you are cleared to land. Fire trucks on the way!" I popped the RAT in order to keep hydraulic pressure and electrical power if the engine quit. Maintaining 180 kts., I rolled onto final and aimed the nose at the end of the runway. Even if the engine quit, with this speed I could glide in to the runway---theoretically. Approaching the groove, I pulled the power to idle. I remembered that the field runway was a relatively short 8,000', and I did not want to run off the other end of the runway onto the busy highway. I dropped the tail hook. I braked the aircraft successfully to a slow speed, not needing an arrestment. I raised the tail hook, turned off the runway and shut down the engine. Our maintenance crew and the fire trucks immediately met me and helped me get out of the cockpit and secure the ejection seat safety pins. The next day, after the maintenance crew had worked all night on the sick aircraft, they found that I had flown through a flock of night-flying ducks. Three had been sucked down the engine intake and damaged the compressor blades, which had caused the fire light. The engine was full of "roast duck," as the Chief put it. They found body parts of three ducks. I had two more strikes on the wing and tail, which gave me a total of five. The squadron declared me an "ace," and painted five little ducks below the cockpit of my aircraft. The maintenance Chief estimated that my engine would have failed in a matter of minutes. Wonderful. The next night, when I tried to catch up on my landings, I hit three more ducks! One of the pilots threatened to turn me in to the Audubon Society for excessive cruelty to birds. Very funny. During the winter of 1970-71, I was spending about two full weeks per month with the Dallas Reserves. This required commuting from where I lived in Los Angeles to Dallas. On one trip, I was in uniform. I shared a cab from the DFW airport to Dallas with a tall, older man in a cowboy hat. He introduced himself as "Joe Foss." Being a student of WWII history, I knew this was one of the top fighter pilots from that war. The Marines had a Reserve squadron of F-8Ks at Dallas, and there was considerable animosity between the two Reserve communities. One of the Marine pilots thought he was the best dog-fighter at the base, and during every Happy Hour at the O'Club, was quick to announce that belief. The next week, I went over to the Navy Exchange on the base and bought a Marine khaki dress shirt, together with Marine CAPT bars and Navy wings. I had the laundry press it to put in the Marine regulation three vertical creases in the back. Then we cut out large 20mm-size holes in the back, and painted them with simulated blood stains. Just before the next Happy Hour, we hung the shirt above the table that the Marines normally used. They came in, looked at the shirt, and then threatened a fight with the Navy pilots, including me. A burly man by the name of Smokey Tolbert ('62) separated the combatants before a punch was thrown. Smokey had been one of the solo pilots in the Blue Angeles before he left active duty to join the airlines. He missed the military flying and had gone back on active duty. He had flown a TA-4 in from the East Coast and was spending the night at Dallas. Smokey said, "OK, boys. I'm neutral, because I am not from around here. If both sides will agree, we will settle this like true warriors. The Marines will pick their champion to represent them, and the Navy will pick theirs. We will get airborne tomorrow at 1000. I will be the official referee and observer in my TA-4, and will score the dog-fights. The losing group will pay for an open bar for the winners at the next Happy Hour." Both sides agreed. The Marines picked their guy, and the Navy picked me. The next day, we took off together and headed south to the normal operating area after obtaining FAA clearance. We separated at about 30,000 ft. on parallel courses, and Smokey called "The fight is on!" from his TA-4. The Marine and I turned in toward each other. The important things in a head-on engagement is to build your energy, and not let the opponent get any angle on you. The Marine knew this also. We met head-on, canopy to canopy at 1,000 kts. closure and the high-g turns began. This guy was good. The first fight was called off when we reached 5,000 ft., the minimum altitude for the joust. Neither of us had been able to work off any angle. No winner. I won the next fight, using the Danish Roll, a displacement barrel roll to the outside of his turn radius. It was clear that if either of us got within 30 degrees angle off the opponent, it was going to be a kill. The Marine won the last one when we both were low on fuel, since he was flying a lighter F-8K. He staggered over the top of a severe vertical maneuver, and I was unable to follow him. A rolling scissors resulted, and he carefully guarded his energy advantage. I finally had to break the "hard deck" of 5,000 feet to evade him, which resulted in a win for him. Smokey declared the overall joust a draw. At the next Happy Hour, the two sides had more than a few drinks together, and the bitter rivalry was put aside. Temporarily. After two years of great flying and good times with the VF-202 pilots, I found out that two F-8 Reserve squadrons were being activated at Miramar, my old home base. Somewhat reluctantly, I transferred to VF-302 at Miramar, which was closer to my Redondo Beach home. It would turn out to be a questionable decision, as politics and big egos dominated the two F-8H squadrons there. However, being a very diplomatic and humble guy, I expected to fit right in. After all, as you know by now, I try to bring harmony wherever I go. In the meantime, the Navy screwed up again. I made LCDR!